With around two decades of work behind us, it is perhaps the right time to step back and take stock of what we are doing. Annually, more than 3000 small and big works are initiated under Goonj’s flagship initiative ‘Cloth for Work’ (CFW) across the most far flung parts of India. Be it Sunderbans (West Bengal), Banihal (J&K) or Keonjhar (Odisha) the effort has been to reach out to the farthest parts of our country. BUT what is it that we really want to achieve with CFW? Reaching 3000+ tons of material every year to people and development work that positively impacts the quality of life for millions of people, is great BUT is that really all that we do? We feel the most important bit is, empowering people to take collective ownership of their own problems and solutions. We are a small team but the spirit of the communities we work with, is massive.. They can move mountains if they make up their mind. This story is a salute to these communities; giving you a glimpse into their resilience and sense of ownership. For all that they do so unassumingly; we have a lot to learn from them. Assi Ganga flows about 14 kilometers away from the main town of Uttarkashi in the Sangamchatti belt of Uttarakhand. In 2012, monsoon rainfall, the bridge on this river was severely damaged. In the absence of an alternate path people would still risk their lives walking on a swinging bridge. In 2013, after the horrific cloudburst and devastation in Uttarakhand, this damaged bridge was also swept away, leaving the people of Seku village completely cut off from the rest of the world. The villagers panicked in the first 6-7 days, fearing that nobody would be able to reach them and they would be stuck forever. Some people unsuccessfully tried the dangerous route of a two kilometers long dark tunnel while others tried to cross the ravaged river. When everything else failed some people threw two fallen tree logs across the stream to re-establish contact with the outer world. At this time Goonj was one of the few organizations reaching out relief to such remote locations in Uttarakhand. We reached this area and motivated locals to build themselves a temporary bridge as part of Goonj’s CFW initiative. Next year, when the heavy flow of water again damaged the Seku bridge in the monsoon, the local Sarpanch, womens’ groups and other ward members reached out to Goonj’s Uttarkashi office. Lack of connectivity was again badly affecting livelihood, causing huge problems during medical emergencies and posing a risk for school going kids. This time all they wanted was some nails and an iron mesh for the base from Goonj. With this little support the bridge was up again on the same spot with the villagers’ labour. Made with the same enthusiasm, as the last time, it was stronger and sturdier but not made under CFW. This is the best part of what we do; when people are self motivated to do things themselves instead of waiting for any outside help. While a permanent bridge still hasn’t come up here despite efforts and demands made by the villagers to the local government. In 2015 when the temporary bridge collapsed again (for the third time in monsoons) the village representatives reached the District Magistrate’s (DM) office and shared their problem and how they had been tackling it in the past. The DM assured that this time his office would bear all extra expenses therefore, the villagers made the bridge again. Fields, streams and canals were still brimming with flood water, distancing people from their own land and property. One such isolated village was Kala Govindpur in Supaul district. Here fields and other facilities remained on the other side of a river which had just come up. The monsoons that followed only added to the struggles of these people. 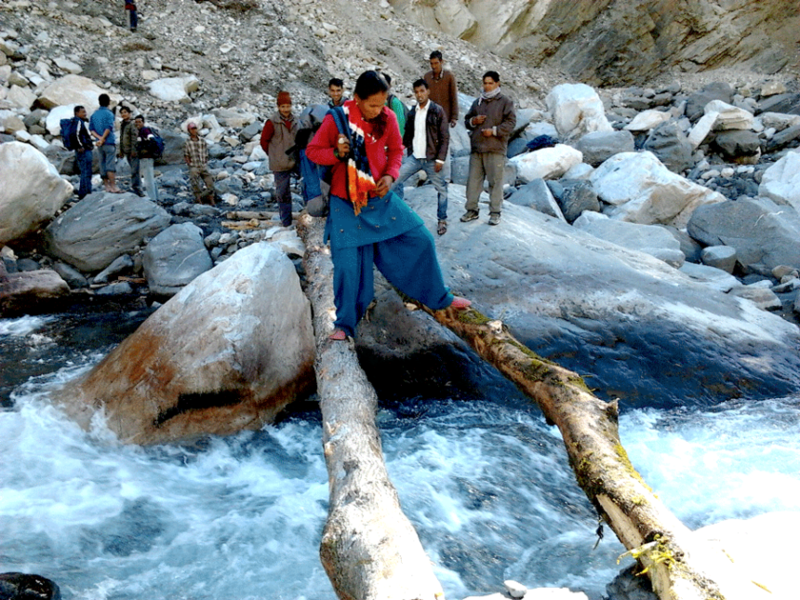 We had recently helped build the first ever bamboo bridge (made under CFW) in the neighbouring village of Sukhasan. We therefore encouraged over 100 people from this village with the Sukhasan story and mobilized them to source bamboos and make a bridge which measured 150×4 ft.